We will dial into the most essential elements of the human healing experience with rich discussion bridging the scientific "how" with the human "why". Together, we will harmonize our minds, bodies, and souls with neurological re-patterning and restoring practices while forming meaningful bonds with inspiring women that will last a lifetime. ALCHEMY. This journey will also incorporate simple yet powerful transformational methodologies to illuminate clarity around any personal or professional challenges you may be experiencing in your life. You will be supported in diving deep into your heart and honoring your truths so that you can heal and be empowered to live life in a way that is aligned with your dreams. You will birth a new realm of grace and beauty that transforms you and the world around you. CULTURE. 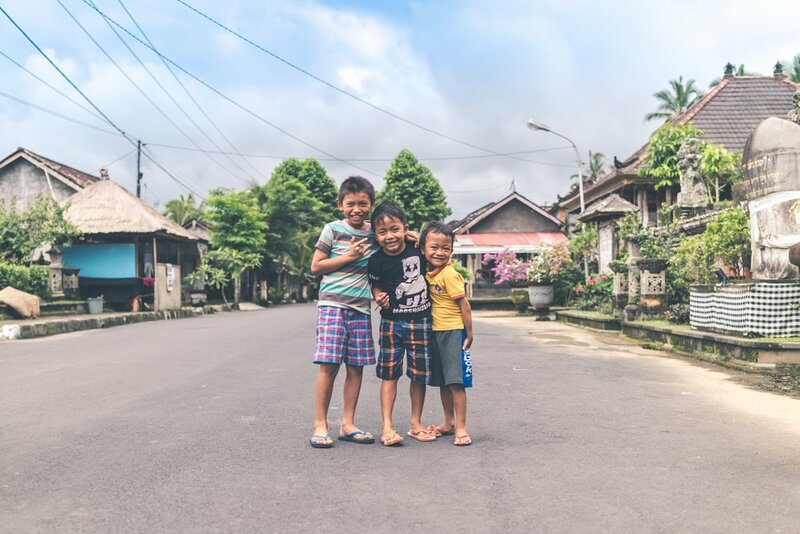 This retreat will offer opportunities to experience temples, traditional ceremonies and dance, local artisans and cultural events all while basking in the beauty of Indonesia. We will also participate in a Day of Silence and meditation in honor of this culture’s most holy day of the year. This will give participants an opportunity to integrate the elements of the retreat and enjoy the special location. In addition, you’ll earn 50 credit hours and a "Experiential" certificate of completion that can be applied to the Soul Flow Arts Institute (SFAI) Training and Certification Program. Heal your mental, emotional, and physical, body as a result of re-patterning the nervous system and even releasing trauma through these transformative somatic practices. Share an expression of your choice on the last night of our journey (optional). This retreat has a limited number of spots, so be sure to register early! All participants must be at least 18 years of age and up and complete a brief questionnaire/application to ensure the group is a good match. While this program may be healing and therapeutic in nature, it should not be mistaken for therapy. *Poi-dancing is an ancient movement and performance art with roots in the Polynesian culture. Modern poi-dancing involves swinging tethered weights, and sometimes fire, in various rhythmic, synchronized, geometric patterns. *Full participation in all classes and workshops (with the exception of evening activities) is required for those participants wishing to receive full credit toward certification. Poi you may use during the retreat (Poi will also be available for purchase. Hula hoops, however, will not be included. We have partnered with an organization offering us high quality travel hoops at a discounted price. ). We've hand-picked Yayasan Bali Purnati because of the previously wonderful experience Dr. Jinju had as an attendee in 2011. It's also the venue of choice for the famous Bali Spirit Festival. Please go here to learn more about this magical location located 15 - 20 minutes south of Ubud, the cultural center of Bali. All photos of Purnati by “Rafael Abella Photography” and "Djajusman Erlangga"
2017 BTT CONTENT . . . . .
AWAKEN & CELEBRATE YOUR INNER FIRE on a 7- day sacred journey of self-expansion, empowerment, and exploration through yoga, dance, and the art of flow in the heart of Pele’s womb, where her beauty transforms and her pulse ignites within the most active volcano on Earth. This is the first transformational, flow arts program* of its kind and we are thrilled to offer it a 2nd time! Immerse yourself in a unique curriculum weaving the science and soul of yoga, dance, and the flow arts into a revolutionary path for somatic healing, transformation, and discovery. Harmonize your mind, body, and soul with revolutionary, neurological re-patterning and restoring practices that have transformed countless lives toward expanded new ways of moving, thinking, and being. Whether you’re new to poi or the hula-hoop or have practiced for years, this retreat is designed for you to experience these modalities as transformational tools and ideal for anyone interested in incorporating the flow arts into their personal or professional practice. Join Dr. Jinju Dasalla and Soul Flow Luminaries as they share the art and science that grounds the therapeutic benefits of these playful practices. In essence, this retreat is a spiritual and somatic wisdom course bridging the scientific “how” with the human “why”, a blend of theory and movement, dialing into the most essential elements of the human healing experience. Whether you are ready to break free from limiting beliefs, seeking clarity, going through a major life transition, or feeling inspired to learn a new dance in sweet community, this intimate - yet playful! - journey is a portal to let your soul flow! Come celebrate the fire within as you discover new realms of creative expression and beauty that transforms. In addition, you’ll earn credit hours and a certificate of completion that can be applied to the Soul Flow Arts Institute (SFAI) Training and Certification Program. *The Soul Flow Arts Training and Certification Program is being offered through the Soul Flow Arts Institute (SFAI) and will launch in 2017. This Beauty that Transforms retreat serves as a Foundations course for the training. Thus, all participants will have the opportunity to receive a certificate of completion upon graduation of this 7-day intensive course with the option to continue in the training program. To explore and grow inside of an evidence- and experience- based curriculum weaving the neuroscience of transformation, flow psychology, yoga, somatics, dance, and play! Begin to master the fundamentals of dancing with poi and the hula hoop. Release tensions, trauma, and old holding patterns in the body leaving you feeling lighter, stronger, and healthier through a this unique somatic movement practice. Benefit from an expanded transformational and healing "toolbox" full of practices and exercises that will support you in cultivating balance, grace and flow. Re-harmonize the masculine with the feminine, mind with body, right with left, science with soul, and knowledge with wisdom. Enjoy a deeper knowing of your innate and vast beauty, brilliance, and wisdom. Learn strategies to develop your intuition, self-trust, and clarity on your life path. Be fully supported in awakening your inner fire and living your biggest dreams while having a blast! This retreat has a limited number of spots, so be sure to register early! All participants must be ages 18 and up and complete a questionnaire/application to ensure the group is a good match. While this program may be healing and therapeutic in nature, it should not be mistaken for therapy. *This rapidly emerging field referred to as “the flow arts” is, at its deepest core, a form of yoga, a path of inquiry. As a transformative and healing somatic practice, a rising number of studies have revealed therapeutic benefits, powerfully restoring and retraining the nervous system. It’s not only an art to unify, bridge, and harmonize various aspects of oneself, but also to weave together many different disciplines into a singular-threaded, creative expression. These disciplines can include meditation, dance, yoga, simple play, and performance; in addition, it includes moving with an object such as poi, staff, or the hula-hoop. This movement art requires learning to move gracefully in relationship to oneself, others, and the natural cycles and rhythms universal to life. All levels are welcome, however, this is not an advanced technical flow retreat. We will cover basic to intermediate tricks & moves with a focus on integrating movement, dance, and yoga. Please be open to having a beginner’s mind! You’re welcome to request privates to deepen your technique. Please keep in mind that while our daily schedule is packed and FULL on, all classes, workshops and activities are OPTIONAL*. This is your journey, your time, your retreat. Please feel free to bow out of any sessions to go soak in the pool or enjoy a massage. This schedule is subject to shift and flow based on the needs of the group. Special Pricing = Pay in Full by 9/22/16 and received $300 off!!! Final payments due by March 1st, 2017. Jinju embraces the power of dance, flow arts, and yoga as portals for somatic healing and personal transformation. As a professional life coach, performer, facilitator, and instructor with a doctorate in neuroscience, Jinju offers truly unique perspectives, pioneering new paradigms for personal growth and transformational learning that harmonize science, art, and soul. Jinju co-founded Soul Flow Arts Institute (SFAI) with her husband, Nova Dasalla, as a platform for training and educating health professionals, individuals, and organizations on the neurological and psycho-spiritual benefits of embodied play. As the visionary leader of transformational Soul Flow Retreats, trainings, and author of upcoming book, Beauty that Transforms, her vision is of a world that remembers how simple and sweet healing can be. She holds emotional attunement as the foundation of all flow practices and believes, to love is to flow. Her classes, workshops and coaching journeys consistently call forth elements of play, possibility, and purpose to ultimately awaken one's inner fire and innate wisdom. Jinju received her Ph.D in Neuroscience from Penn State & 200RYT from the Hawaii Yoga Institute. Nova, co-founder of Soul Flow Arts, is USA's #1 ranked acrobatic paragliding pilot who is also known for being the first American to pull off a trick called the Infinite Tumble. He is probably even more known for his film, Infinite Stumbling, that tells the story of his life-altering accident in 2009 when one of his routine maneuvers went dramatically wrong, smashing him into a mountain. Not only did he manage to learn how to walk again but he also was given the gift of embracing life, love, and gratitude on a profound level. This short film has been shown in multiple film festivals around the world and Nova has been featured in national magazines including Origin, Cross Country, the television series, Xterra Adventures, and the inspirational, adventure sports film, The Red Helmet. Nova still flies and is an extraordinary, living example of what it takes to face fears, engage flow, and always aspire beyond the norm. An illustrious & gentle force, Tracy is a creator of magical & healing experiences. She is a massage artist, body worker, dancer, yogi, hula hooper, lover of movement arts, writer, emotion evoker and inspirer. She radiates and mirrors pure joy, light & love to all beings. Tracy has recently stepped into the role of yogi facilitator with great enthusiasm! She believes that her role in sharing any healing is that those who need and will be most impacted through her as a healing conduit will appear in synchronicity. She draws upon a wealth of information from both personal life and professional experience in the healing arts realm. She continues to serve in her private massage practice, Synchronicity Massage, and her blog Talk Story. Una Viggiani is an artist, yogini, world traveler, and inspired instigator. She earned a degree in Fine Art from the University of Colorado at Boulder, and her Masters degree in Education at the University of Denver, but ultimately learned the most traveling the world on a solo journey that lasted two years and took her to 22 countries. She discovered yoga as a way to balance the demands of teaching, but it soon became much more than that. Yoga became a way of life for Una and making the shift from art teacher to yoga teacher came naturally. Now, she combines her love of art, yoga and travel by teaching workshops and organizing her new company, Bella Retreats, allowing the physical, creative and spiritual realms to merge into one. Their experienced staff, assisted by resident volunteers, dedicate time, energy and care to our guests. They offer healthy vegetarian-friendly cuisine, comfortable accommodations for every budget, rejuvenating bodywork treatments, recreational facilities, and educational adventures. Kalani Honua means harmony of heaven and earth, and this is what we aspire to. We welcome all in the spirit of aloha and are guided by the Hawai'ian tradition of `ohana (extended family), respecting our diversity yet sharing in unity. We invite you to open your heart to the Big Island of Hawai’i at Kalani Oceanside Retreat. AMAZING! Nova and Jinju agree it’s the best food they have experienced in all our travels around the world at various retreat centers. There's something for all diets, including vegan, vegetarian, and gluten-free. Yay! Three times a day, guests and staff are summoned by the call of the conch to dine on their open-air lanai (veranda). At this central gathering place, you can experience the daily rhythms of assembly and departure reminiscent of ancient village life. Kalani cuisine encompasses a variety of styles including Thai, Indian, and Italian. Their chefs have extensive training and a common interest in creating healthful and delicious meals. 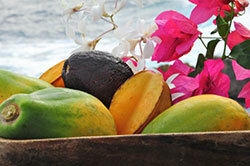 They celebrate the abundance of Hawai’i by serving local tropical fruits and vegetables and fresh-caught fish. Seafood is often served at dinner (chicken and beef are served occasionally), and vegetarians are well-cared for. Most importantly, their chefs firmly believe that the care and love invested in the cuisine is transmitted to the diner, and everything is prepared with aloha. Kalani is located on acres of tropical beauty on the southeast coast of Hawai'i Island, also known as "the Big Island". Our retreat is a 45 minute drive from the airport in Hilo, or a 2.5 hour drive from the airport in Kona. Hawai'i is less crowded and less commercial than other Hawai'ian islands, and offers a variety of spectacular natural attractions. Kalani is located near Kilauea, one of the world's most active volcanoes, where fire goddess Pele expands the island daily. The dramatic lava cliffs of the Kalani coastal area provide for close-up views of turtles and dolphins, and seasonal whale watching. The cliff also provides a haven for sunbathing, meditation or yoga. The nearest beach is about a 10-minute walk from the retreat center. It’s a beautiful black sand beach and many locals hang there and play. It is also a clothing-optional beach. WARNING: the Pacific in the winter is rough and can be potentially dangerous! Only swim if you are a strong swimmer with experience in large ocean waves. On the free day you could arrange transport to a beach that is a little more tame. We will be there in spring, so should be a bit calmer than usual, though better to not take any chances, as several drownings occur there every year. If you have a craft you would be interested in vending, please let us know and we can work it into a potential retreat marketplace. There is internet access in a few locations so feel free to bring your computers. We do advise, however, to leave all work at-home, as the connection is inconsistent and super-slow. We will open the journey with a welcome circle and orientation at 5 pm on arrival day, March 20, just before dinner at 6 pm. There will be an opening ceremony just after dinner. On the final day, March 27, we will check out of our rooms early and join the larger Hawai'i/Kalani community at ecstatic dance in the morning before lunch. For those of you interested in playing in the magic with us a bit longer after the retreat at Kalani, we welcome you to join us for a 7-day Soul Flow Dolphin and Decompression Retreat. This retreat will also a great way to celebrate the new friendships and ohana (family) that will be birthed during your time at Kalani, or for alumni, to reunite with the soul flow ohana that was birthed at last year’s retreat! We will let you know when registration opens - there will be limited spot and we expect it will fill quickly! This event is being offered first to the Soul Flow Alumni from previous 2015 and 2016 retreats and they'll be allowed to bring a guest!